The Munster valley - also called St Grégoire valley - stretches west of Colmar, the administrative centre of the Alsatian Upper Rhine region. This valley was affected, as most valleys in the Vosges mountains, by 19th century industrialisation which brought about textile industries and related enterprises, but it still relies more than other Alsace valleys on agriculture and the production of dairy products. The valley's most important town, Munster, gave its name to a famous regional cheese. Railway construction, however, found its promoters among the entrepreneurs, and a local industrialist, who also was the mayor of Munster, obtained in 1865 a concession to build a Colmar-Munster link as standard-gauge local railway. The line opened in late 1868. Construction work had been paid to a large extent by the town of Munster, who after the French-Prussian war of 1870/71 was happy to get rid of that line, which then was incorporated into the "Elsaß-Lothringen" (EL) network. The promoters had dreamt of the Munster valley line forming part of a new, more direct international route Paris - Vienna, a dream fostered by the new German administration who, in 1878, opened a rail link from Colmar to Neuf-Brisach, Breisach and Freiburg (the latter two in the German region of Baden) built to main line standards. However, despite ambitious plans that were discussed at the turn of the century and again in the 20's when the other Trans-Vosges projects finally materialised, the Munster valley line never had a realistic chance to became a through line, as the topographic situation simply was too bad. Only a short 6 km extension was opened in 1893 between Munster and the village of Metzeral almost at the upper end of the valley, bringing the line to a total length of 23 km. Despite many ups and downs, this line is still in use, although freight traffic is nowadays almost inexistent. Passenger service, on the other hand, is quite active, and the Munster valley line can be considered as an example of how secondary branch lines can be operated and commercialised successfully. When in Munster a new high school was needed, it was erected next to the station on the place of the former goods shed, so that a huge proportion of schoolchildren's transport is done by rail. But the Munster valley is also of interest for tourists and hikers, and therefore, during the last years, a lot of activities were organised by local associations and administrations in order to develop leisure traffic on the line. E.g., there were steam-hauled hikers' trains which were operated by using the rolling stock of the nearby Chemin de Fer Touristique du Rhin (CFTR) that normally operates steam and vintage trains on the (rather boring) Volgelsheim-Marckolsheim industrial branch. During the summer season of 1999, a regular Sunday service was reintroduced after more than 15 years of Monday-to-Saturday-only train running. One can only wish that these positive developments will go on and be successful, so that this picturesque branch line's future may be secured. There is not much variety as far as rolling stock is concerned, as all normal trains on the Colmar - Metzeral route are operated by EAD railcars. The present weekday timetable (field no 191 in SNCF's National Timetable) shows nine pairs of trains running between both endpoints of the line, and same partial workings limited to the Colmar - Turckheim and Munster - Metzeral sections. Photographs will be able to make nice photos around the Colmar main station (with its beautiful and impressive station building) and the Colmar St-Joseph stop, but the scenic part of the line begins at Turckheim, a nice medieval wine-growers' town that is worth a visit. Though the entire line from Turckheim to Metzeral is of interest for photographing, good locations are most easily found on the upper section west of Munster. Munster station had ancient EL signalling systems until the mid-80's, but many tracks have been lifted since then. Munster was also the starting point of an electric 11 km rack railway, built with meter gauge, that climbed up the Vosges mountains to the Schlucht pass between 1907 and 1914. 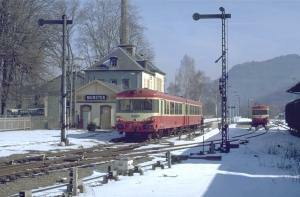 Passengers could cross the German-French border there and take another narrow gauge train down to the mountain resort of Gérardmer. 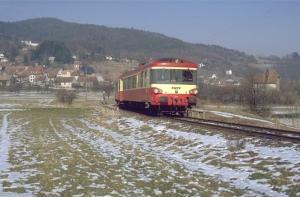 The Munster - Schlucht electric railway was damaged during World War I and never opened again. Now let us go on to the last branch line presented in this survey, i.e. the Thur valley line.